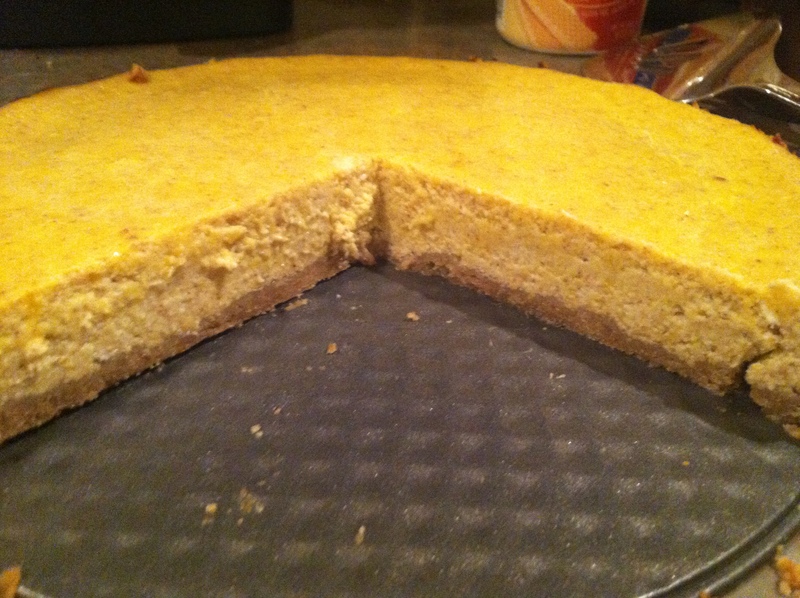 I found a recipe in my current issue of Cooking Light magazine for Pumpkin-Hazelnut Cheesecake. While that recipe looked delicious and all, I didn’t have those ingredients, and wouldn’t follow the recipe much anyway. Then, while at the grocery store buying ricotta cheese, I took a turn into bizarro land and decided to substitute Greek yogurt for cream cheese. My cheesecake (it still has ricotta cheese, so I decided it was still cheese-cake) is nothing like the magazine, and I started with doubts about whether it would even end up like cheesecake. 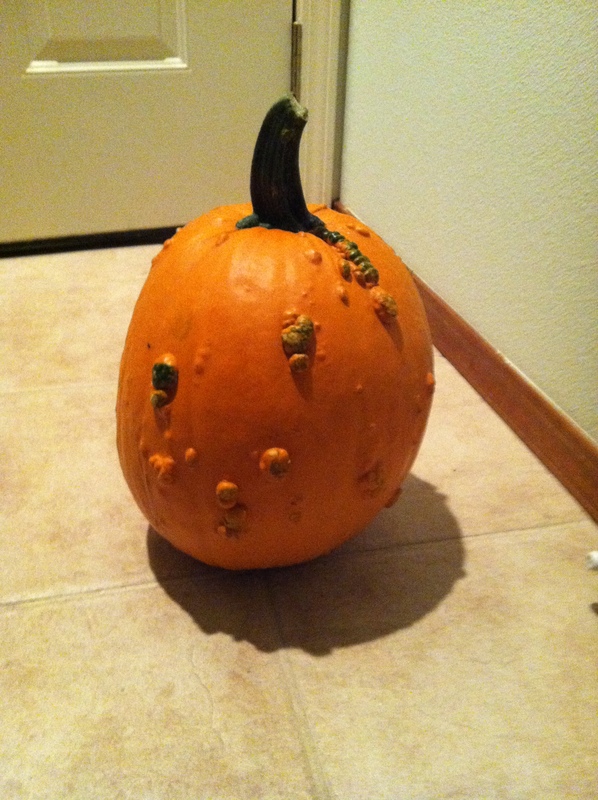 First, we roasted our warty pumpkin. He was a completely different beast from to the last pumpkins we roasted. The exterior was much tougher and once I got the chef’s knife stabbed into him, I ended up using the knife as a handle to slam the pumpkin against the cutting board and move the knife a few inches along the middle. 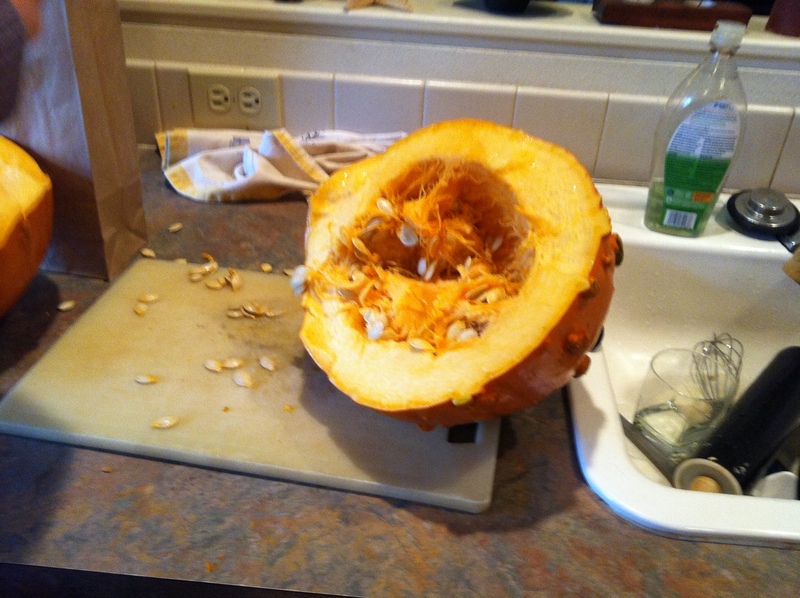 After about 5 or 6 slams, the pumpkin cracked roughly in half. The pumpkin flesh was much thicker in this pumpkin, which meant roasting took more like 1.5 to 2 hours for each half of the pumpkin. 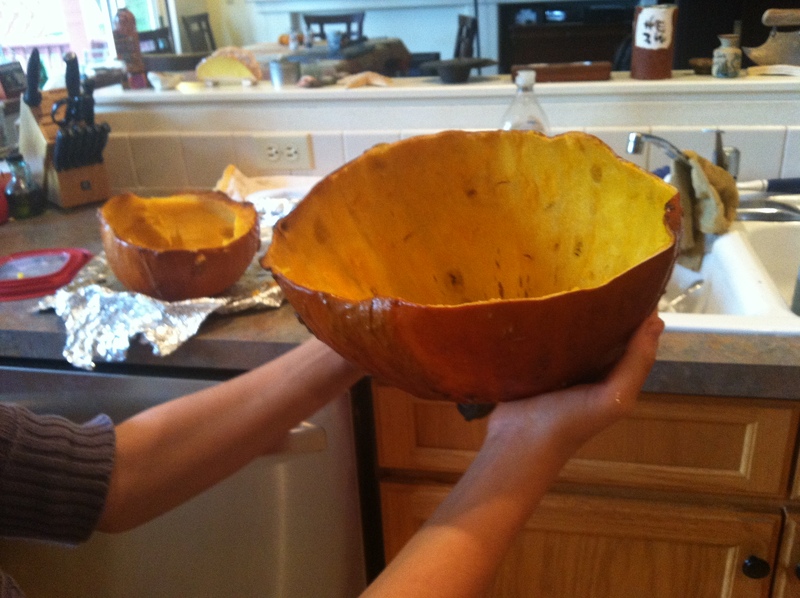 After he was roasted, the remaining skins were much tougher and made great bowls. My daughter decided to make Halloween candy dishes out of them. After roasting, we scraped out and puréed the flesh. I had one left over ball of walnut pie crust. While that thawed, I preheated the oven to 350°. I pressed the thawed dough into a 9″ springform pan and baked for 10 minutes. 1.5 c. FAGE brand Greek yogurt (It is really thick and creamy which is why I thought it would work). 1/2 t. ground cinnamon Mix on low speed until smooth. Pour pumpkin batter into springform pan with crust and bake for one hour. At one hour, I went to check and the center didn’t move when the pan was bumped. 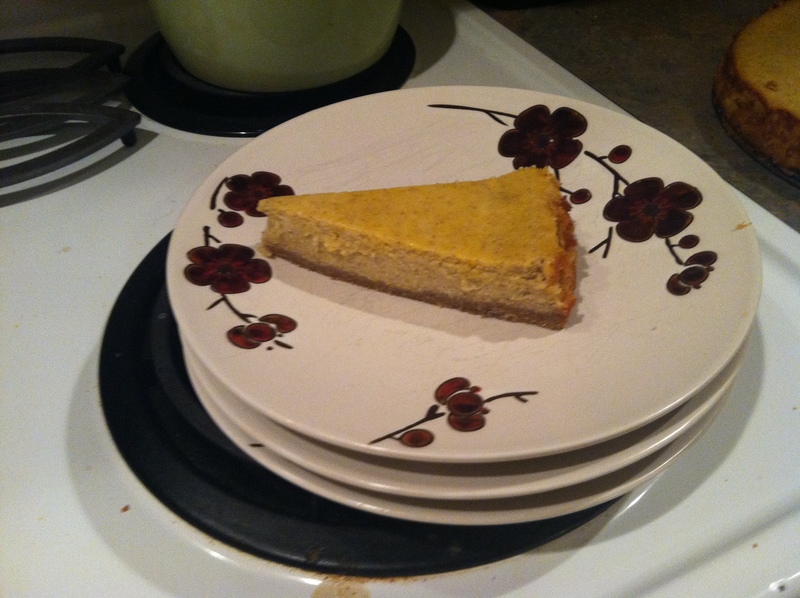 I ran a knife around the outside edge of the cheesecake, and left it to cool on a rack. 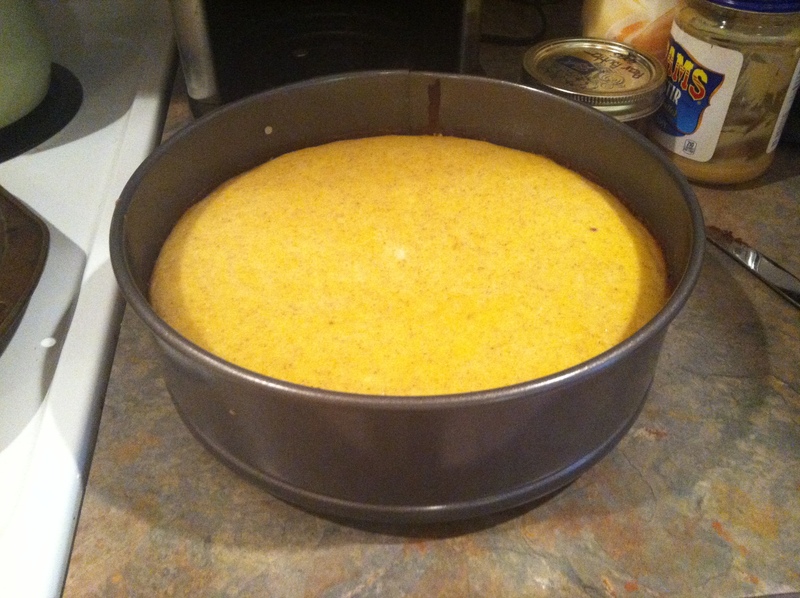 I let the cheesecake cool for several hours before carefully releasing the ring of the pan. It still looked like cheesecake. . . When I cut into it, the texture was even all the way through. . . Finally, the big test, how did it taste? My son said it tasted great! I don’t know if it is healthier than with cream cheese, but I really enjoy this particular brand of Greek yogurt and now that I have found it at Costco, it will be a staple in my fridge. I rarely have cream cheese, so being able to swap the yogurt for cream cheese makes me happy. And isn’t that really what is most important? 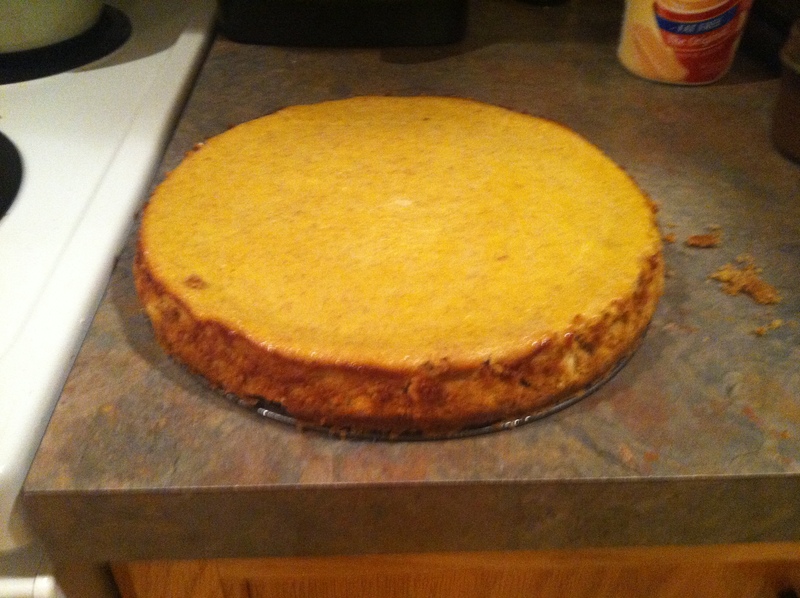 This entry was posted in Recipes and tagged cheesecake, dessert, greek yogurt, pumpkin, ricotta, roasted pumpkin, Thanksgiving, Walnut crust. Bookmark the permalink. This looks great. Switching out cream cheese for greek yogurt is definitely a healthier choice, although I’ve never tried it. Kudos to you. I roasted a pumpkin this weekend too. It was my first, and I kind of feel like the king of the world. I may have to try this with a gingersnap crust–I bought a bag of gingersnaps after reading a pumpkin cheesecake recipe last year, and finally chucked the bag this summer when I’d given up finding the recipe. Now that hockey season has started again, I am nearby a Costco once a week and can add Fage to my weekly hummus pickup.